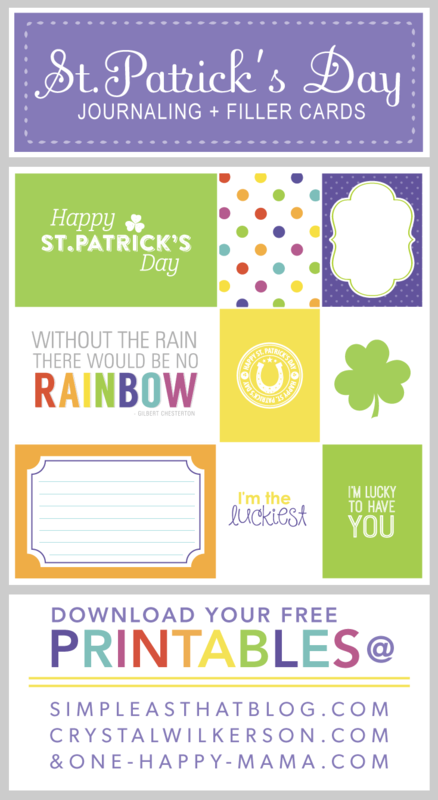 Today I’m happy to share a super cute printable that I created with my good friends Rebecca Cooper & Kristina Proffit. I’ve gotten to know these fun & talented ladies through phone calls, skype chats, & emails over the past four years & I love it when I get the chance to collaborate with them! Just recently I was able to meet up with Rebecca for the first time in person when we roomed together at a blog conference in Salt Lake City. Hanging out with Rebecca was my favorite part of the trip! One of the things we discussed was putting together some more freebies for our blog readers. If you enjoy freebies & want to see more in the future, please help us spread the word by sharing this post on Pinterest, Facebook and Twitter. You can get the entire set by visiting each of our blogs: Simple As That (Rebecca’s Blog) & One-Happy-Mama (Kristina’s Blog). Hope you enjoy them & have a wonderful St.Patty’s Day! You can download my set HERE. k I love these. I found my way over from rebecca’s site. Smart to have all three blogs on the post. I love your header and newsletter font and colors. Thanks for the freebie! so cute, thank you for these! It’s basic, however effciient. You could might write up coming posts talking about this short article. I have to continue reading problems over it! I love looking at your site and appear toward all your posts! Let me make sure to book mark your website.